I know what you are thinking. The words “bacon” and “healthiest” do not belong next to each other. Funny story. I went to this conference with a bunch of registered dieticians and we were served breakfast. When I saw the tray of applewood smoked bacon, I shouted, “Yippee! !” My happiness was met with blank stares. After we all sat down, I looked around the room and I was the ONLY woman foolish enough to have put two slices of bacon on her plate. I decided to shove them in my purse because I was so embarrassed (not really :). So... Center cut bacon is better than the alternative? As good for you as turkey bacon? Cuz, honestly, I just canNOT do turkey bacon. Blech. Neither can I, Erin. I hate turkey bacon as well. I figure if you are going to have bacon HAVE BACON. 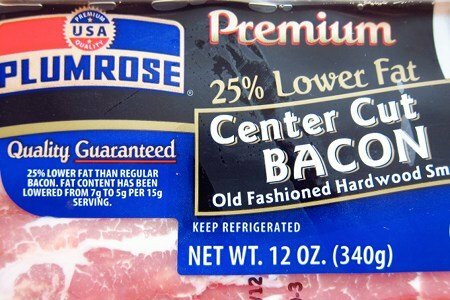 But, there are some products such as “center cut bacon” that cut down on the bad sides of bacon. Center cut bacon does have less fat than regular bacon and if you eat just two slices you will get your calorie consumption down to 56 calories versus about 76 calories in regular bacon and reduce your fat intake by 25% when compared to regular bacon. It tasted the same to me as regular bacon - it just had less of that fatty part of the slice. Another product that you will see is “No Added Nitrites” bacon. What this means is that there is no sodium nitrate added to the bacon. There is, however, celery juice and sea salt added to cure the bacon and they naturally contain nitrates. Basically, if you are trying to avoid nitrates, you should just keep away from processed meat. The real key here, which is obvious to most of you, is to just limit your consumption of bacon. Bacon with eggs followed by a bacon cheeseburger and a meatloaf with bacon on top is just not a balanced diet. A couple of slices of bacon tossed into a salad every once in a while is a treat and a flavor enhancer. Treat bacon as a condiment of sorts and enjoy it when you have it. and, DON’t try to shove it in your purse. I have a nitrates question, since I'm probably not as knowledgeable about nitrates as I should be. Which contains less nitrates overall, the bacon with the sodium nitrate added or the 'no nitrates added' bacon that has celery juice and sea salt which contain nitrates? My Husband loves bacon on everything, but i try to stay away from it. If I must have bacon I'l buy turkey bacon. It's not the same, but close enough!! Good article. Another option is a product called Faken Bacon which I buy at the health food store. It is a tempeh product and will not replace the real stuff for like bacon and eggs for the diehard bacon lover. However, crumbled it brings you the same flavor in other recipes. For example I made a California style pizza and used this as one of the toppings with chopped up cooked chicken breast, chopped fresh tomato and a small amount of mozz. on one of those Boboli whole wheat thin pizza's that you recommended and then served it with the more healthy Ranch dressing recipe that you provided....it was fabulous. Also this product keeps well in the frig. Give it a try! Thanks Sharon I will look for Faken Bacon. The pizza sounds good. On the rare occasion I treat myself to yummy bacon, I choose Applegate Organic Sunday Bacon. It's more expensive another reason to eat less but it feels better knowing its from a pig that was antibiotic-free, fed GMO-free feed, etc. plus naturally occurring nitrates from celery sounds healthier too. It's so delicious this time of year with native tomatoes for a juicy BLT! If anyone doesn't like turkey bacon they haven't tried the right brands! I ONLY eat turkey bacon and there are only two brands worth my time: Oscar Mayer and Lou's Garrett Valley. All the others taste like cardboard. Local bacon isn't bad for you if it is eaten in moderation, like you say. Fat is fine, as long as it is from an animal that is raised on natural feed and scraps. Chemicals in, chemicals out. You are what your pig has eaten. What do you know about Skinny Cow products. I see them in the ice cream freezer and now on the shelves at the grocery. Have you tried Lilydale Daystarters Turkey "bacon". I am in Canada and I get it from Costco. I think it's delicious. I'm with you Mrs. Lee. Turkey bacon is great without all the grease. I love Oscar Mayer bacon in the red packaging...not the blue. I can't remember the difference between the two. It has the best flavor!!! I can't imagine not liking it. I have totally switched to everything turkey. We eat very little beef! How about 'bacon bits' or 'bacon pieces' by Hormel? They come in tall, narrow jars and are usually found near the salad dressings in groceries. I have used bacon pieces sparingly, in recipes like broccolli salad. I know its a processed food item, but a small amount adds flavor. How about that bacon that you just have to warm up in the microwave. It seems to be pre-cooked. Healthy bacon comes from pastured pigs, and is either uncured or naturally cured. It's full of healthy fats. ANY pig that is factory-farmed on an unnatural diet is automatically going to create an unhealthy pork product. Sorry, but end of story. Ihave a question about bacon-What about Canadian Bacon? Isnt that supposed to be "better" for you ? because my kids prefer the Turkey Bacon as we don't eat any beef or pork so they don't like the flavor. I have a bacon question. My husband separates the meat from the fat on his slices and only eats the meat. How much healthier does this make the bacon? He also does this with all meat products. Cristina, I concur on the organic free range meats of all kinds, would rather go without otherwise. I admit to loving bacon like most of us on here but for years searched for a good brand. I cook it up and freeze it, then take it out in small portions, that way its convenient and not messy! I might crumble it over a baked potato, in a bean soup, or chowder, or use in a spinach salad! mmmm! I ordered some pepper bacon this morning from a local farm. I know bacon isn't healthy, but I love it as a splurge and this way I know where it came from!